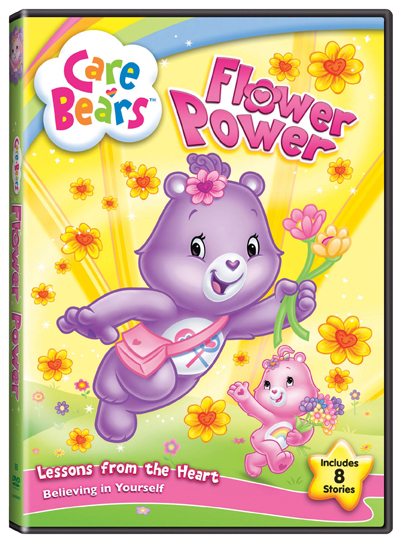 OVERVIEW: Celebrate the summer with Flower Power as Lionsgate Home Entertainment releases Care Bears: Flower Power to DVD, Digital Download and On Demand this June! Featuring the final eight unreleased episodes from the new television series starring everybody’s favorite furry friends, the all-new title focuses on “Believing in Yourself,” a theme that help kids develop emotionally and is mom-friendly. With more than 300,000 DVDs shipped to date, the franchise has proven itself a strong children’s brand that parents trust. In addition, the Care Bears brand has more than 40 U.S. licensees debuting cool new publishing products and apparel in 2011. Featuring the kid-friendly direct play option, Care Bears: Flower Power will be available on June 7, 2011. The Care Bears brand enjoys 98% awareness among moms of girls ages 2-5 (Fall 2007 Q Scores Report) and boasts over one million unique monthly visitors to CareBears.com. Beloved since the 1980s, Care Bears continues to be one of the most recognizable and top preschool properties today (according to Lieberman Consumer Research January 2007) and has sold over $2.6 billion in retail since 2002. SYNOPSIS: Spring has sprung in Care-a-lot! All the Care Bears are here and full of sunshine cheer in eight tales blooming with Flower Power! When Share’s Dilly Daisies become a fashion craze, everyone learns it’s about the Bear, and not what they wear, that counts! And discover what happens when Oopsy believes a four-leaf clover will bring him the good luck he needs before a big race. Then, prepare for a heat wave as Grizzle aims his ‘Magnifrier’ on Care-a-lot, and only the Thunderwhales’ cooling rain can help restore spring. Join the Care Bears for fun in the sun and more in these adventures! Flower Power: Share’s garden is blooming beautifully with Dilly Daisies, made especially beautiful by Bumpity and Tweazle’s special rain. They become a Care-a-lot fashion fad and all the bears learn that it isn’t what you wear, but who you are that counts! Luck ‘O the Oopsy: Oopsy wants to participate in the Care-a-lot Grand Prix, but he seems to be plagued with bad luck. Will a chat with Good Luck Bear and a four-leaf clover help him see where real luck comes from? Heatwave: Grizzle is at it again, using a giant “Magnifrier” to heat up Care-a-lot! Will Share get over her fear of the Thunderwhales and get them to save Care-a-lot with some cooling rain? Erased: Grizzle’s eraser ray doesn’t quite work, but it did turn the Care Bears’ badges upside down and changed the way they act! Not quite themselves, they learn about being supportive, considerate, and honest, but not before over-doing it in some funny ways! The Bubbles: Funshine is sick with “The Bubbles,” an illness that makes Care Bears start to float away. But he won’t take care of himself, so now he’s hiccupping bubbles and has to stay in bed. Resting is no fun- what could a little extra play hurt? Harmony Unplugged: When Love-a-Lot suggests that Harmony perform a concert for Care-a-lot, Harmony’s inner diva comes out. Will she get her ego under control, or drive away all her friends before the big show? Belly Blanked: Funshine’s feeling lost after losing his belly badge until Grizzle comes to destroy Care-a-Lot-- with Funshine’s badge glued to his tummy! Using his smarts, Funshine proves that it’s not the badge that makes the bear. Good Knight Bedtime: Grizzle has taken over Dreamland! Will timid Bedtime Bear (the one bear with power over dreams and sleep) find his bravery to stop Grizzle and save the night?